★★★★ The Independent It’s always a pleasure to visit the Tobacco Factory. The director Andrew Hilton has been winning golden opinions for the ensemble seasons he’s mounted here. Hitherto, though, the accent has been on Shakespeare and the Jacobeans. Presenting this new production of Three Sisters, the company, so good in its magical Pericles, leaps into very different territory. Communication in Chekhov is mostly between the lines and in the eloquence of what is left awkwardly unsaid. And where the blocking in an emblematic play like Pericles can have the diagram-like disposition of a dance, in the poetic realism of Three Sisters there’s a tricky balance to be drawn between expressing the hapazard informality of domestic life a-swarm with guests and signalling the deep psychological patterns. The experiment has paid off beautifully. This Three Sisters is both emotionally lucid and socially textured, both heart-snagging and alert to the ways that, in Chekhov’s plays, the absurd and the tactless have an habit of ensuring that bathos will try to undermine pathos and yet only succeed in intensifying it. Particularly good are the scenes between the fêted yet fated failure of a brother, Andrey (an excellently fagged-out Stuart Crossman), and Paul Nicholson’s vividly etched Ferapont, the old servant of the district council. Noticeably more bilious on the second occasion and expertly paced, their duets (so to speak) are little masterpieces of mutual inadvertence; the hard-of-hearing up against the hard-of-noticing. And there’s another fantastic sequence where the clandestine intimacy between Lucy Black’s prickly, poignant Masha and Paul Currier’s shinily well-scrubbed and on-best-behaviour Vershinin is made half-public by the stray, unguarded way she doodles along to a song he’s humming. All three sisters are strongly played – Daisy Douglas is affectingly dogged in defeat as Olga, and Catherine Hamilton progresses with rich insight and luminous stage presence into bleak unforgiving adulthood as Irina, her girlish vulnerability developing a defensive hardness. Looking like a faintly bonkers cross between an officer and a Romantic poet, Nathan Rimell gives a disturbing comic edge to the intense, cranky Solyony who is a disaster waiting to happen. ★★★★ The Guardian It was a good bet that Andrew Hilton’s directorial style would serve Chekhov as well as it serves Shakespeare, and so it goes. I don’t think that I’ve ever seen a Three Sisters that is quite as funny, quite so gloriously human. When Catherine Hamilton’s Irina announces indignantly “You think I’m such a little girl. I’m 20”, she does it like a five-year old delivering her party piece. Esther Ruth Elliot’s Natasha shows her discomfort round the Prozorovs by lumbering like a young cow and then turning into an old spiteful one once she has married Andrey and got control of the household. A lot of the pleasure comes from Nicholas Wright’s version and the way he uses humour and language to reveal the inner characters. But it is Hilton who makes sure that the lines are so delicately pointed. When Andrew Collins’ schoolteacher Kulygin pompously informs Colonel Vershinin “My rank in the civilian world would be approximate to yours”, you understand why his wife, Masha, so despairs and wonders whether there really is life before death. If this is a play about exile – the sisters see themselves as exiles from Moscow where they long to return – then this Masha (Lucy Black) has exiled herself from her husband and her family through gnawing unhappiness. She knows she is a fool. “I’m depressed,” she says cheerfully. ★★★★ The Mail on Sunday … The company at Bristol’s Tobacco Factory also have a deservedly high reputation for making Shakespeare sound fresh and new-minted and it looks as if Andrew Hilton is bringing the same intelligence, care and detail to Chekhov with a very well performed production of Nicholas Wright’s version of Three Sisters. By arranging the audience on three sides he turns us into eavesdroppers on this drama of disappointment and disillusion in which all the unhappy characters are forever talking out loud to themselves, lamenting, with varying degrees of self-pity and stoicism, the absence of excitement in a stifling provincial town. Nathan Rimell is an intensely creepy Solyony with an absence of social skills that is almost autistic; Paul Currier’s spuriously sophisticated colonel brings a convincing spring to the step and sparkle to the eye of Lucy Black; Catherine Hamilton’s Irina settles for doing her duty fighting despair with a determination which breaks your heart; Daisy Douglas is a sweetly prim older sister whose sympathy outweighs her disapproval. Esther Ruth Elliott is splendidly slappable as the appalling upstart sister-in-law acquiring airs without any grace at all. ★★★★★ The Western Mail ONE thing we don’t have here [South Wales] is a theatre company that offers classic plays presented with a modern sensibility that harnesses textual fidelity to freshness of approach – but a short trip over the Bridge will more than satisfy that demand. Bristolians have appreciated Andrew Hilton’s Shakespeare At The Tobacco Factory for some while now and after five years as an unfunded marvel the company has won national recognition – and branched out to tackle more modern work. Chekhov ushered in the 20th century with his Three Sisters and changed the course of European theatre, but there’s a change in attitude to Chekhov these days, with more of an emphasis on the comedy in his work. Hilton eschews the dream-like ensemble interpretation and instead gives us a set of clearly-delineated characters who express their philosophies of life with conviction. At The Tobacco Factory we sit on three sides of the action, so making us seem like voyeurs, a 21st century British audience looking in on a set of 19th century privileged Russians who waste their lives talking, dreaming and doing nothing – no wonder, we think, that there was a revolution within five years. The danger of staging Three Sisters with such clarity, with such attention to the text and with such emphasis on the individual, with such critical distance, is that emotion can be sacrificed – and, indeed, for much of this production we are witnesses to displays of stupidity, superficiality, intellectual posturing, hypocrisy and fantasising, alongside genuine concern for the future of humanity, for individual happiness and for personal satisfaction, that we can feel we are being held at arm’s length from the inner feelings of these three sisters, their brother and his bourgeois wife, army friends, the cynical doctor, the schoolteacher husband – until a final act that wrecks you as all those suppressed emotions, especially within the sisters, explode. It’s a marvellously controlled production, then, and one that does reinstate the real comedy in Chekhov as well as rip aside the facade of intellectualism and propriety of pre-revolutionary Russia. But the beauty of this Three Sisters is that it is so much more. There is no escaping the challenges of Chekhov, such as how to accommodate both the sadness and the comedy and how to acknowledge his apparent prescience in foreseeing the dramatic upheavals in Russia without making him seem like a political prophet – and how to deal with this story of the idle rich, insensitive bourgeois and impractical intelligentsia today? Hilton’s answer is intelligent and dramatic. For a start, he suggests that Chekhov, as the father of modern theatre, was not only one of the creators of naturalism but of absurdism. The sisters’ constant hope that they will go to Moscow we know is as impossible as the arrival of Godot and the doctor’s final words “nothing matters” offers a startlingly post-modern take on the human comedy. Hilton also suggests, it seems to me, that the ongoing debate in the play about the future, that is highlighted so effectively in his production, ends ambiguously; our final image is of the sisters, posed like a tragic group of three muses, looking decidedly apprehensive – as if they knew that while the fine words of the utopian theorists promised a brave new world, the cynics might have the final word. 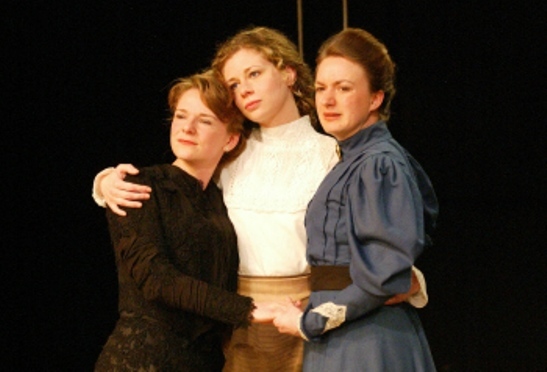 Three Sisters is the third in the quartet of plays – the other three being The Seagull, Uncle Vanya and The Cherry Orchard – for which Anton Chekhov is now chiefly remembered and admired. He wrote it in medically-prescribed exile in Yalta only a few years before his death from tuberculosis at the age of 44. By ‘exile’ I mean from Moscow – that centre of culture and society to which the three sisters of the play (who were born there) long to return. Unlike his characters, Anton was not himself a Muscovite. He was born and brought up in Taganrog, a provincial port about six hundred miles south of Moscow on the Sea of Azov. But Moscow was where he trained to be a doctor; where he made his name, first as a short story writer, then as a dramatist; and which provided a base for his life from 1879 until his first move to Yalta nearly two decades later. It was also where his theatre was – the Moscow Art Theatre of Namirovich-Danchenko and Constantin Stanislavsky – and where his wife, the actress Olga Knipper, worked as a leading member of the company. The idea of exile – of being, either in space or in time, somewhere other than where one should be or wants to be – pervades this play; as if human life is in some form of suspension, awaiting some destination, either for the individual or for the species itself that will be happier, more fulfilling or acute, more like living than the impoverished place of the present. But we should be wary of scanning the play for mouthpieces for Chekhov’s own theories, predictions or ambitions; or even for a metaphor for his own predicament. The ideas belong to the characters alone, for whom past and future are prisms through which to experience, escape from, understand or cope with the present. And in that they are not the effete, idle, wishy-washy ‘Chekhovian’ Russians of theatrical tradition, ever elegant but moist-eyed; they are the good and the bad, the angry and the stoic, the lazy and the hard-working, the selfish and the self-sacrificing. For all that our world has changed profoundly in the last century they are – essentially – us.